China launched a suborbital rocket Monday night on an apparent high-altitude science mission, according to media reports. The launch occurred Monday (May 13) at 9:00 p.m. local time from the Xichang Satellite Launch Center in southwest China, the nation's state-run Xinhua news service reported. "The experiment was designed to investigate energetic particles and magnetic fields in the ionized stratum and near-Earth space," Xinhua reported. "According to a preliminary analysis by the NSSC [National Space Science Center], the experiment has reached expected objectives by allowing scientists to obtain first-hand data regarding the space environment at different altitudes." The rocket reached an altitude of 6,200 miles (9,978 kilometers), making it China's highest suborbital launch since 1976, according to Reuters. Researchers say that future launches on similar trajectories could carry anti-satellite weapons, but there's no evidence at this point that Monday's liftoff was any kind of ASAT test, the Reuters story added. China has peformed several ASAT operations in the past few years. 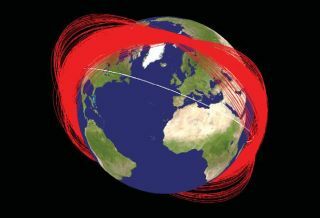 In 2007, for example, the nation destroyed one of its own defunct weather satellites at an altitude of 530 miles (850 km), spawning about 3,000 new pieces of space junk. A 2010 test used similar technology to take out an object that was not in orbit. So the United States and other nations are watching closely for any signs of further Chinese ASAT development, which could theoretically put American satellites at risk. This scrutiny, combined with the details of Monday's flight, invite a healthy dose of skepticism to any claims that the launch was a secret Chinese ASAT test, some experts say. "It would be silly for China to try to disguise a test with a bunch of scientific instruments, barium powder release, etc. It would not work, not with the U.S. watching so intently, and that's not what you want to do to validate a stockpile weapon," Mark Gubrud, a postdoctoral research associate in the Program on Science and Global Security at Princeton University, told SPACE.com via email. "If you only want to test the kill vehicle, do a low-altitude 'missile defense' test," Gubrud added. "There would be no good reason to conduct a high-altitude test other than to validate the complete system, multi-stage booster + kill vehicle, in an operational configuration."